Help your hair remain free from split ends and frizz by periodically applying a nourishing hair oil or hair conditioning mask. 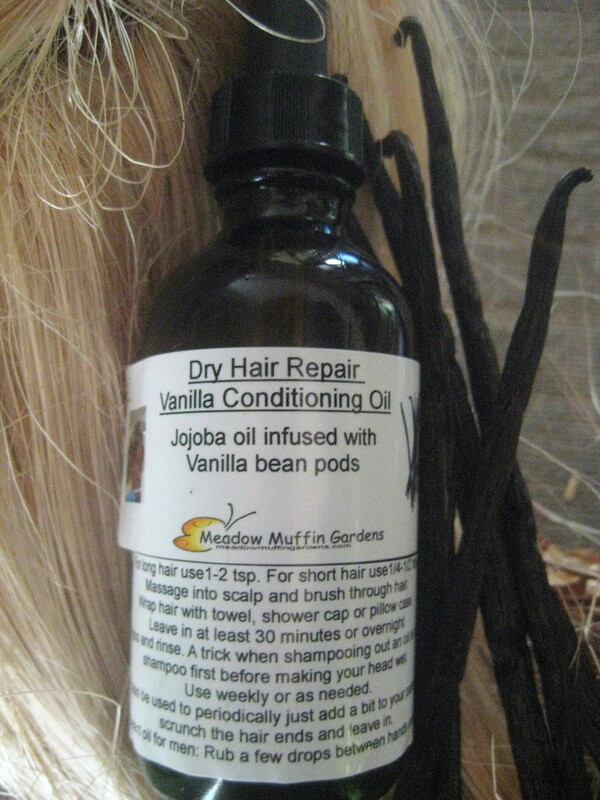 Vanilla infused Jojoba oil makes for a beautiful blend your nose and your hair will love. Bearded men find the use of a beard oil very beneficial for not only a softened beard but as an aid in taking care of the skin underneath their beards. 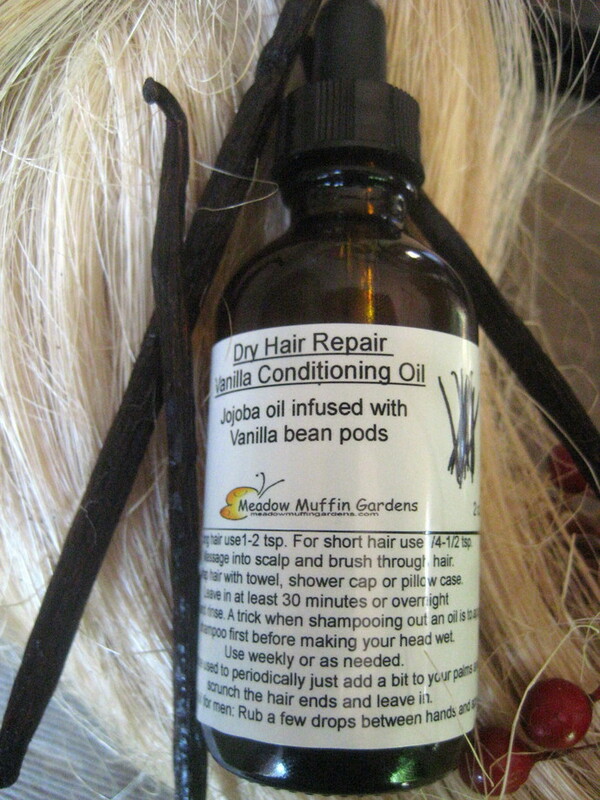 Jojoba oil makes a fantastic hair conditioning oil. A desert shrub, jojoba oil is actually the liquid wax extracted from the plants' seeds. 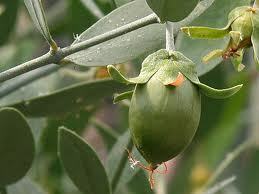 Jojoba oil so resembles human sebum that it acts as a protective coating, sort of like a second skin. The shafts of your hair will quickly absorb this deeply penetrating oil. The vanilla bean pods used for this infused jojoba oil are the natural, organic product of a labor-intensive agricultural crop. The vanilla plant (Vanilla planifolla) is grown as a perennial herbaceous vine in countries that are near the equator. It takes almost five years for the vines to produce beans ready for harvest. Once harvested, the pods must go through a sun drying, curing process to turn them into the fragrant brown pods of which we are familiar. Natural vanilla is not the same as synthetic vanilla. Ninety-five percent of all vanilla used as a fragrance or flavoring is synthetic. Rather than just smell good, only natural vanilla beans can offer you the true, therapeutic value to the brain and nervous system. Vanilla can have a positive effect on those dealing with depression and anxiety. Vanilla is rich in both antibacterial properties as well as antioxidants. Therefore it only makes sense that an oil infused with a natural source rich in nutrients would not only be very useful to help maintain healthy skin, but play a role in hair care as well. You are receiving 2 oz. pure Vanilla bean infused Jojoba oil, not cut with other carrier oils. This Vanilla oil contains no added essential oils, therefore there are no concerns as to the safety for its use by pregnant women. The jojoba oil used is unrefined jojoba which is golden in color rather than the refined which is clear and odorless. At checkout you can choose whether you want just vanilla or a touch of lavender essential oil added. 2. Scrunch a bit of oil into just the ends for touch up care. I often do this before bed. Using just a little bit will add luster and shine without the need to wash out. For short hair use 1/4 - 1/2 teaspoon. For long hair use 1 - 2 teaspoons. Apply the desired amount to scalp and brush throughout your hair. Wrap hair in a towel to build up some heat and leave in for at least 30 minutes or even overnight. Shampoo and style as usual. You can use weekly or as needed. A two ounce bottle consists of 12 teaspoons therefore each bottle can give you several hair treatments. How much to use at a time depends on your hair texture. A little goes a long way so you'll have to experiment with how much to use to avoid your hair feeling greasy. A trick to washing out an oil is to apply shampoo before making your whole head wet. 4. As a beard oil, you only need a few drops. Rub between the hands and massage the bearded area.